The latest updates from the Indonesia terror attack. Plainclothes police aim their handguns toward suspects outside a café after a series of blasts hit the Indonesia capital Jakarta on Jan. 14, 2016. Update, Jan. 14, 2016, 10:55 a.m.: Police have lowered the estimated death toll among victims of Thursday’s bombing and shooting attacks in Indonesia to two. The New York Times reported that authorities were now saying that five attackers had also been killed and four suspects arrested. The Guardian reported that the two victims included a police officer and a Canadian civilian, and that there were at least 17 people wounded. The Times reported that the apparent site of one of the attacks was “within yards” of a United Nations building. After November’s attacks in Paris, the U.N. security council unanimously adopted a vote calling on all able states to fight ISIS in Syria and Iraq. 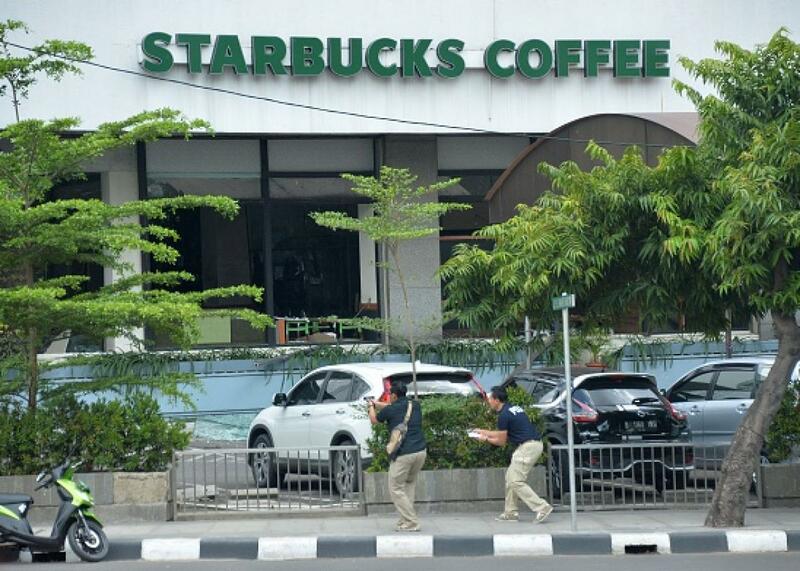 Reuters reported that local media said six bombs went off and that one of the blasts was in a Starbucks. While it hadn’t been established who was responsible, police spokesman Anton Charliyan told reporters “We have previously received a threat from Islamic State that Indonesia will be the spotlight.” He told media that three policemen and three civilians had been killed, Reuters reported. “We must not be afraid, we must not be defeated by an act of terror like this,” Indonesian President Joko Widodo said. “We all are grieving for the fallen victims of this incident, but we also condemn the act that has disturbed the security and peace and spread terror among our people,” Widodo also said. Indonesia is the world’s most populous majority-Muslim country, but it has a secular government and influential Christian, Hindu and Buddhist minorities. Though it is far from the conflicts of the Middle East, the country has experienced several terrorist attacks by Islamist militants that have killed hundreds, including bombings on the resort island of Bali in 2002 and 2005, and at international hotels in Jakarta in 2003 and 2009. Splinter cells of Jemaah Islamiyah, the now crushed Southeast Asian terrorist group that was linked to Al Qaeda, have targeted the police in recent years. The headline of this post has been updated to reflect developing news.